Silver American Eagles were the first official silver bullion coins produced by the United States. First released in 1986, they remain one of the most popular options today for those who aim to diversify their portfolios with investments in silver. Whether you’re interested in physical possession of silver, or adding silver to a retirement account, Silver American Eagles could be a good fit for your investment planning. Let’s take a closer look at the coin and what makes it unique. Silver American Eagles were authorized under the Liberty Coin Act, passed on July 9, 1985. Certified by the United States Mint, the coin contains 1 troy oz. of 99.9% silver. The coin features the famed Walking Liberty design, produced by Adolf Weinman in 1916, on the obverse. The reverse side features a heraldic eagle with a shield, designed by John Mercanti in 1986. The American Silver Eagle has a face value of $1, though it is sold and traded according to the current market value of silver. Like its gold counterpart, the American Gold Eagle, the coin is also offered in a proof version, whose value can also be affected by its scarcity and condition. The production of Silver American Eagles was the result of a unique budgetary approach by the Reagan Administration in the mid-1980s. In 1984, the government faced a ballooning deficit and a growing surplus of military silver reserves. In an attempt to reduce the deficit, the government decided to sell its surplus silver in the form of coins. As a result, the Liberty Coin Act was passed, and the American Eagle Silver Bullion Coin was struck in 1986. 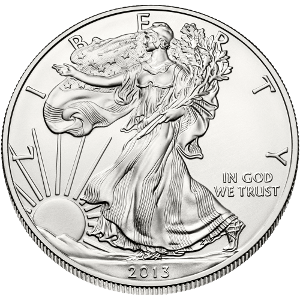 With a composition of 99.9%, the Silver American Eagle gives collectors and investors the opportunity to invest in a virtually pure silver asset, guaranteed by the United States government. Both the bullion and proof versions of the coin are also approved for placement in a precious metals IRA. This gives investors the opportunity to protect their retirement savings with investments in physical silver, while enjoying all the tax benefits of a retirement account. Like other precious metals, silver offers an alternative to investing in the volatile stock market and can be used as a hedge against inflation and the declining dollar. To purchase the American Silver Eagle, or learn more about the advantages of investing in silver, contact Birch Gold Group at (800)355-2116.